ART & ARTICLE | These really cool designs are totally mind-bending. Cameron Gray was born in Melbourne, Australia in 1984 and currently resides in Tasmania. Known primarily as an emerging graphic artist & photographer, Cameron has qualifications in Graphic Design, Multimedia Design, Photography and Contemporary Arts, as well as a keen interest in new media, sculpture, jewelry making, painting, experimental video and sound design. His influences and admirations include Stephen Kasner, Troy Ruffels, David Ho, Ryan Larkin, Bill Viola, Ash Sivils, Janelle McKain, Simon Haiduk, Steve Danzig, Alex Grey, Fabrice Lavollay, and Pieter Bruegel to name a small selection. In 2002 Cameron won the AGFA Australia award for best body of Pre-tertiary photography with his work at Launceston College. In 2003 his works were exhibited in Art Rage and published by the Queen Victoria Museum & Art Gallery and in 2005 Cameron was accepted into the guest gallery of the Museum Of Computer Art in New York. In 2009 Cameron graduated from the Academy of the Arts, Tasmania, with a Bachelors Degree in Contemporary Art and was inducted as a life member into the Golden Key International Honour Society, for finishing in the top 15% of his studies at the University of Tasmania. In 2010 Cameron was nominated for an ARIA Award (Australian Record Industry Association) along side Australian artists Birds of Tokyo, Angus & Julia Stone, Blue Juice, and Tame Impala in the category for Best Album Cover Art of the year for his work with Australian rock band Dead Letter Circus and Warner Music. His tools and equipment used include a 27″ iMac using Photoshop, Bryce, Poser, Apophysis, Vue, a Wacom Tablet, Digital Microscope, a Pentax K20D and an Underwater modified HD vide0 camera. Some selected collaborations include: Warner Music, Dead Letter Circus, Born of Osiris, Paradigm Shift, Sebastian Siegel (Actor/Producer), Eric Anderson (Director), Sumerian Records, Prosthetic Records, Katana Productions, Abstrakt Pictures, Century, Deligma, Nuclear Blast Records, Thematic, Alpha Centauri, Declan O’Shea (Cyclefly/Mako), Esoterica, Circle of Contempt, Ginger, Dyonisis, Mantris, Farebridge, Jasper Faolan, Swivelhead, My Kingdom Records, Arctic, Mind’s I, Forever Eve, Avenue Six Left, Fallujah, Fervor, Anthony R. Karnowski, Caleb L. Mabry, nEgoist publishing. Cameron’s work is regularly displayed in live music venues across Australia, the Museum of Computer Art in Brooklyn, New York, and his body of work has been selected for preservation by the National Library of Australia as one of the countries artists of the 21st century. 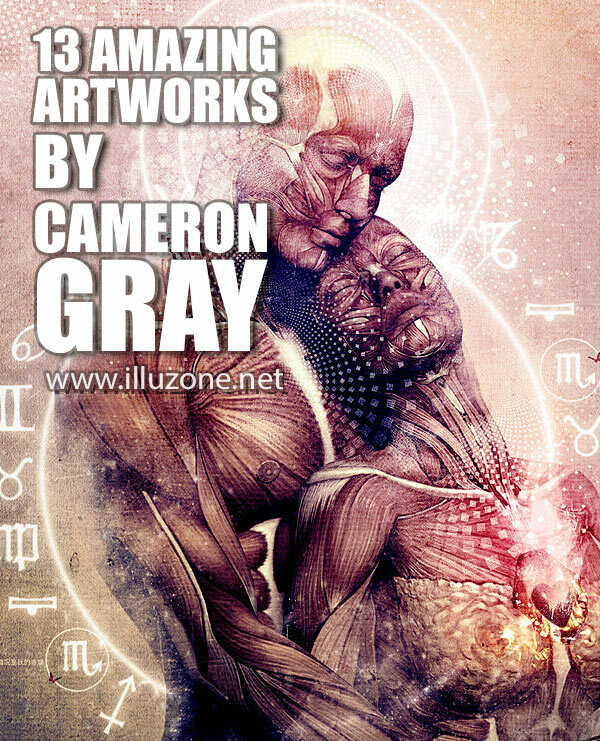 More here on Cameron Gray here.